Marketplace MangoPay Payment Gateway For Magento2 is an ideal end-to-end payment solution for the marketplace stores as it enables the platforms to accept multiple currencies and multiple payment methods online, including cards and direct debit(GiroPay and Sofort). This module will split the payment to multi sellers for your eCommerce store. MangoPay can hold the fund on segregated accounts, in trust. Furthermore, it fully automates the payouts. This payment gateway is an add-on of Marketplace Module. To use this module you must have installed first Magento2 Marketplace. Allow buyers to make payment using cards Carte Bleue (CB), Visa, Mastercard, Maestro and Diners(currency allow as per Mangopay) and Direct Debit(GiroPay and Sofort). Now lastly create two folders (mangopay & mangopaytmp) in pub/media/ path. After running the commands, you have to log into the admin panel and you have to clear the Cache. You can refer to the below screenshot. 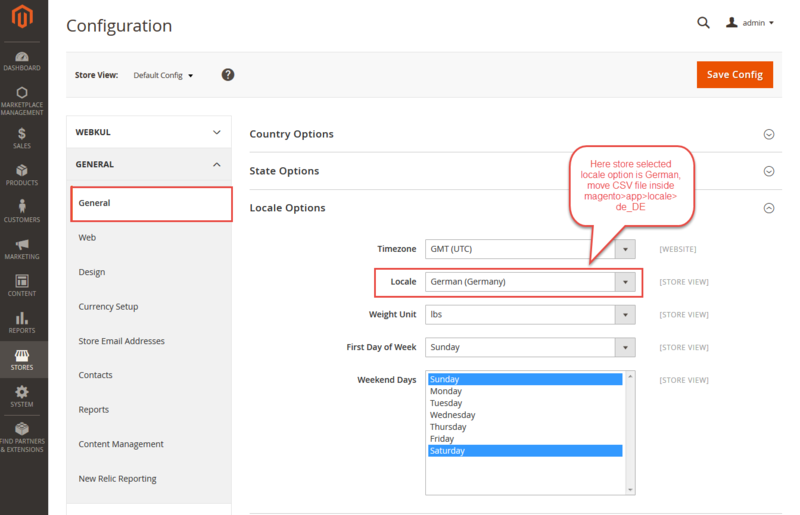 For the multilingual support, admin will navigate through Store->Configuration->General ->Locale Options and select the locale as German (the language into which admin want to translate his store content). If a user wants to translate their module from English to German then they need to follow the path app/code/Webkul/Mpmangopay/i18n in their unzipped folder and will get a CSV file with name “en_US.csv”. Now they will rename that CSV as “de_DE.csv” and translate all right side content after the comma in the German language. After editing the CSV, save it and then upload it to the path app/code/Webkul/Mpmangopay/i18n where they have installed Magento2 on the server. The module will get translated into the German Language. It supports both RTL and LTR languages. After the successful installation of the module, you will find the configuration settings by navigating through Stores-> Configuration-> Sales->Payment methods-> Marketplace Mangopay Payment Method. 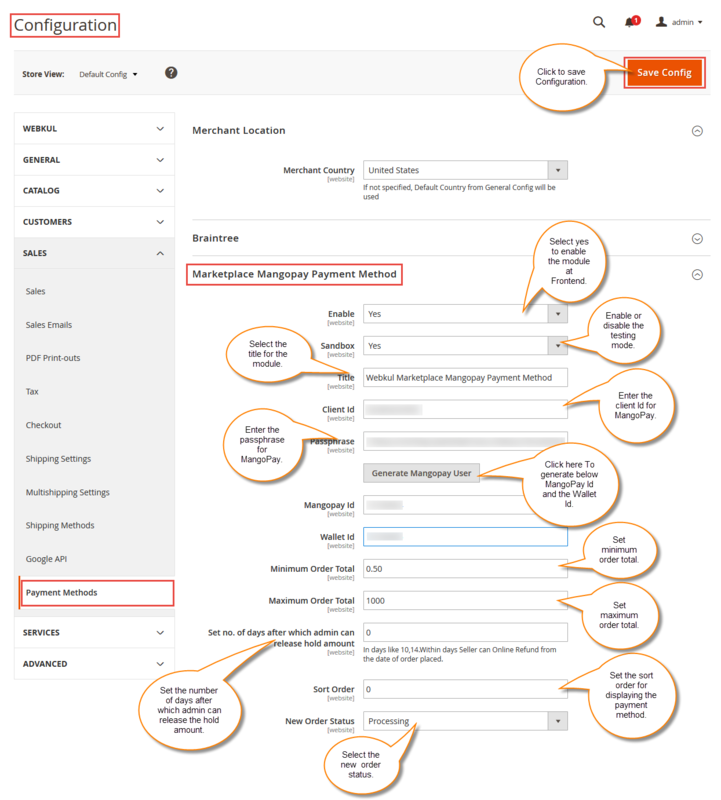 Enabled – admin can enable/disable Magento Marketplace MangoPay Payment Gateway. Sandbox Active –By this option admin can enable or disable the Testing(sandbox) mode. Title – Here admin can set the title which will display on front-end. Client Id – For which MangoPay user is registered. Passphrase –Given by MangoPay after registration. Generate MangoPay User and Wallet Id – Generate a MangoPay Escrow Account’s User and Wallet Id, so that money will be transfer to admin’s Escrow account. Set no. of days after which admin can release hold amount – The main usage of this field is for the online refund process. That is if the customer wants to go for an online refund, then he has only the set no of days (for example 10 days) to go for the refund after that he can not go for the online refund request.validation time can be set as per your requirement. Also if the validation time is set to, for example- 10 days as shown above, then the seller will be able to request for withdrawal only after 10 days. Admin will also be able to release the amount to the seller only after the set validation time period (For example – 10 days). Sort Order – Here admin can set the sort order value. New Order Status – Here you can set the status of the new order. After creating MangoPay account, you will get a ClientId (set by you at the time of registration) and a passphrase. The admin will follow the path Marketplace Management -> MangoPay Payment -> Hold in Escrow and click on the “Release Amount” button to release the payment. Admin will be able to see the transactions with a “Release Amount” option button and a “Wait For Validation Period” option label. For the transactions that have crossed the set validation period (For example- 10 days as set above) will have the “Release Amount” button option displayed and the transactions that have not yet crossed the validation period will have “Wait For Validation Period” option displayed in front of them. This is how MangoPay payment process works. When the customer makes the payment, the money is escrowed in the customer e-wallet. After the validation time is over, the admin can transfer the payment from the customer’s e-wallet to seller e-wallet. After getting client Id and passphrase, set these values to Marketplace MangoPay Payment Gateway’s Configuration settings, and now generate MangoPay user-id and wallet id to accept payment from the buyer and split the payment into sellers. 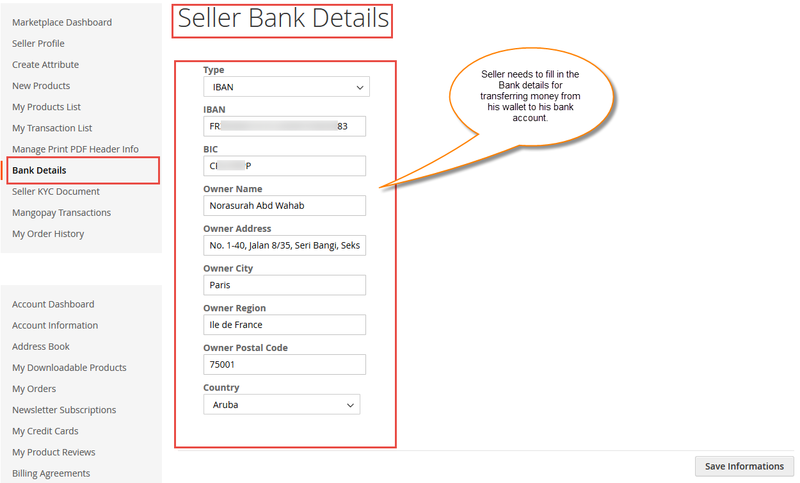 When all the configuration settings at admin end are done, the seller needs to set his Bank Account Information to make transfer money from his wallet to his account, like in the given screenshot. Note – If the seller does not enter correct account details then he can not receive payment using the MangoPay payment gateway. 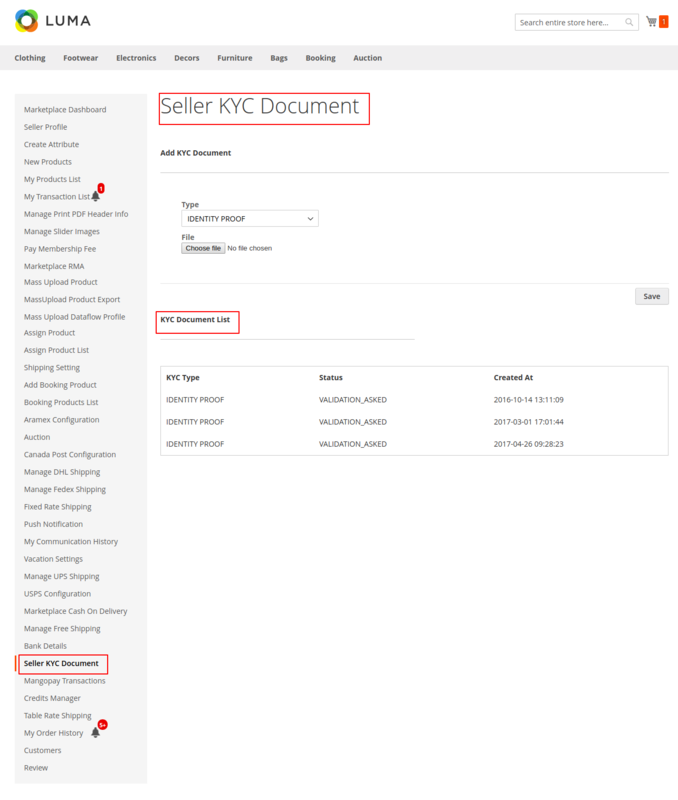 Seller can provide KYC (know your customer) documents to get some extra privileges ( transaction limits ). Also, KYC provide secure purchasing to the customers. 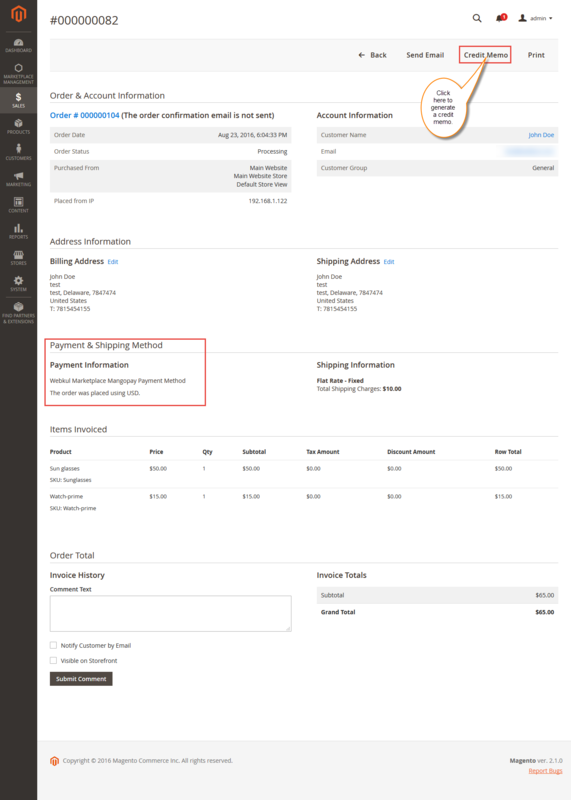 If Marketplace MangoPay Payment Gateway method is enabled from the admin panel then the buyer can see this payment method under the “Payment Information” as shown below in the given screenshot. A snapshot to show the Direct Debit(GiroPay and Sofort) options at the checkout time. After clicking on the “Place Order” button, you will be redirected to the Mangopay payment gateway where the user will input his card details to make the payment, as shown below in the screenshot. After a successful checkout, amount payouts to MangoPay Escrow’s buyer wallet. If any error occurs during a transaction then the order will be created with order status “Pending Payment” otherwise status will be “Processing”. 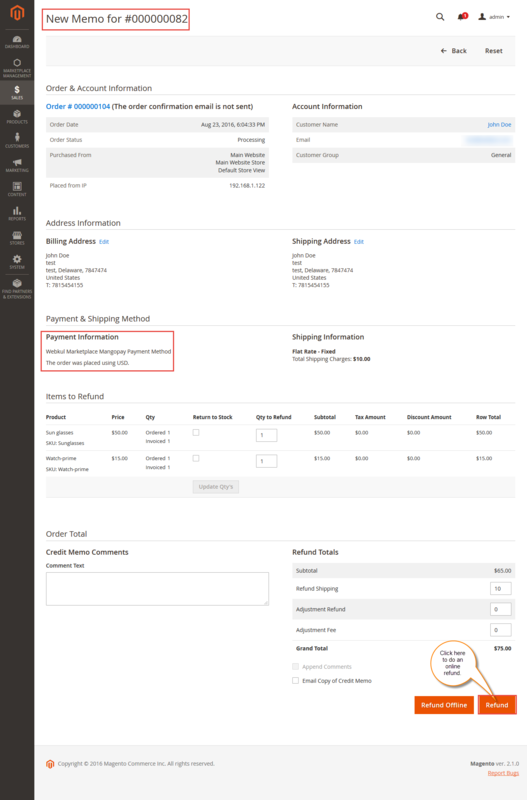 For transferring money from store to account, the seller can request for withdrawal from his Marketplace Account -> “MangoPay Transactions” tab as shown in given screenshot. The seller can request only for the orders for which payment has been done using Marketplace MangoPay Payment Gateway. The “Transfer To Bank” button is hidden up to the set validation time (For example 10 days as set by the admin in the backend) and only after the 10th day, the button appears here in this section of the seller for requesting a withdrawal. Marketplace Mangopay Payment Gateway provides an easy refund to their customers. 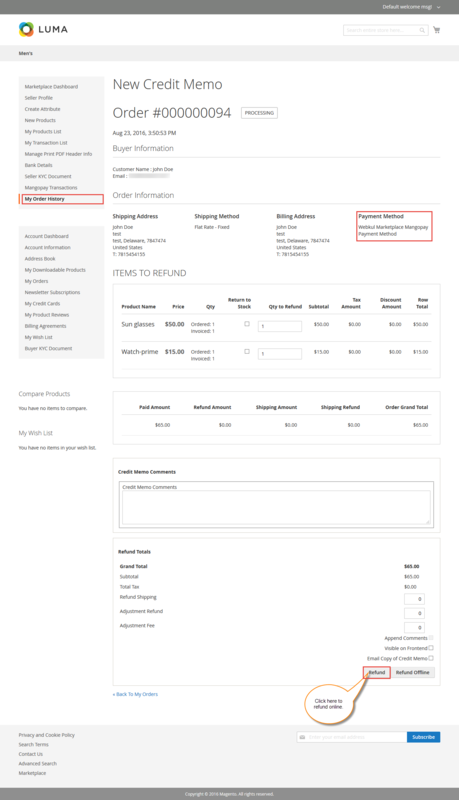 Now admin/seller both can do full/partial refund easily. 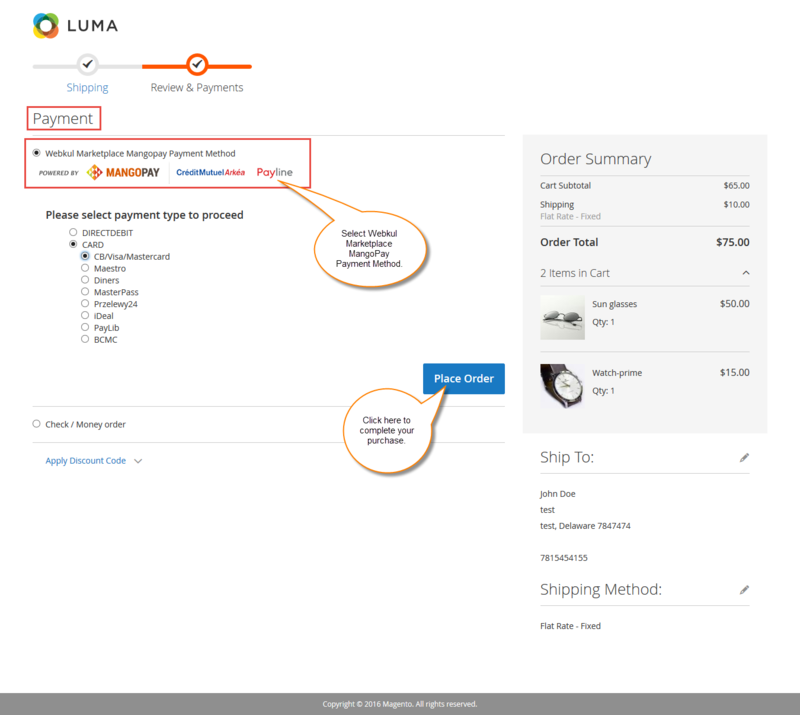 For doing a refund, the seller will have to navigate to “My Order History” and then click on the order for which they want to do a refund and then click on the Credit memo tab for the refund. 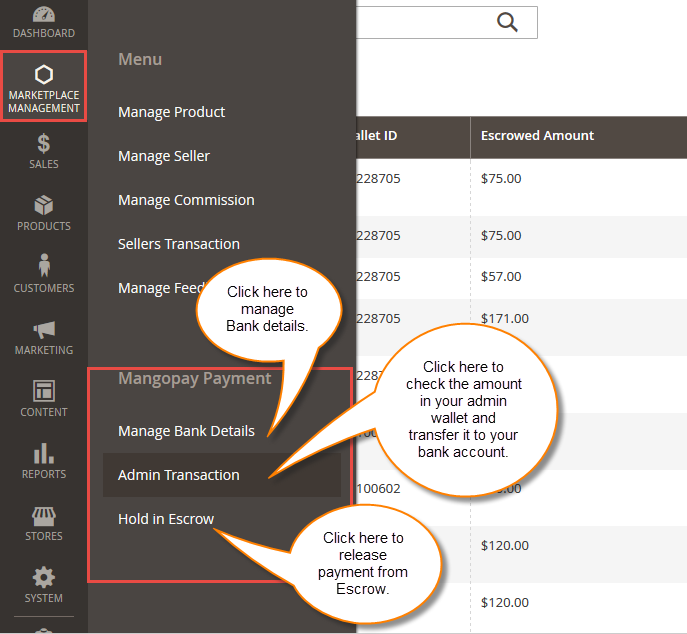 Once seller clicks on Credit Memo button, a page will open where the seller will have an online refund option. After clicking on Refund button, the seller will complete refund process. When the seller does the online refund, the escrowed amount in the buyer’s wallet goes back to the same bank account from which the buyer made the payment. 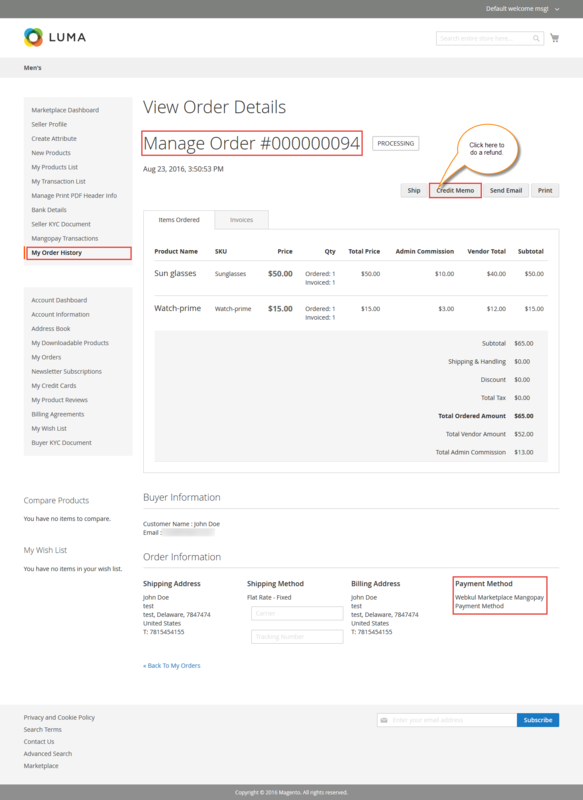 For the refund admin have to navigate to the invoice page for the placed order for which admin wants to do a refund. 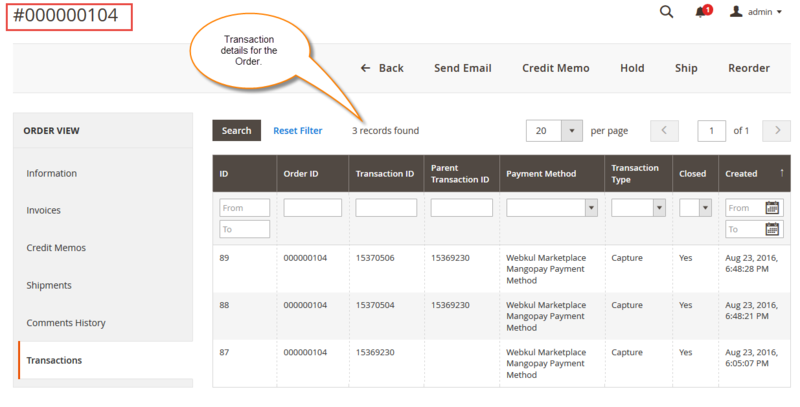 Now click on the invoice for which you want to generate the credit memo. After that, the page that opens up, click on the credit memo button. After clicking on Credit Memo, you have to click on Refund button. When the admin does the refund, the escrowed amount in the buyer’s wallet goes back to its same bank from which the buyer made the payment earlier. Admin can see the transaction details of refunded order. There was error during fetching results. Please email us at support@webkul.com and our support team will assist you.